"Jim Misko's The Path of the Wind is an entertaining and insightful novel about the life and times of an American schoolteacher. What's more, it's a moving love story. Anyone who's ever taught school or wondered what it would be like to teach will love The Path of the Wind." "Misko is a natural storyteller. His characters aren't constructs, but feel like they are flesh and blood. Once again, Misko delivers!" "After having been a teacher for over 23 years and doing battle for my students who were often lost in an uncaring system, I can identify with Jim Misko's Miles Foster and tell you this is a novel that cries to be read not only for its tension and good writing, but for its theme. A must for those looking for a quality read!" "I have been an ardent fan of all of Jim Misko's novels. They just get better and better as they exhale the soil and soul of Mid-20th century rural America. The Path of the Wind is his latest and best and constantly brings to mind Wallace Stegner. I also taught in rural schools during the era Misko is writing about: I knew Miles in many teachers to be the truly dedicated and charming knucklehead that Misko portrays him to be. And, I did know some characters just like Superintendent Calvin Brooks to be the 'scoundrels' that they were. Misko literally has you touching, smelling and seeing the Central Oregon countryside and its small towns. Pick this wonderful and charming book up and you won't put it down." "SMALL TOWN, SMALLER MINDS. In a poor, working-class Oregon town, young, progressive teacher Miles Foster must overcome the provincial powers that be if he is to reach his impressionable students—and save his career. 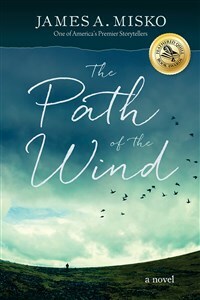 The Path of the Wind is a powerful novel by acclaimed author Jim Misko." "There were tears in my eyes as I finished reading Jim Misko’s The Path of the Wind. They were good tears, the kind that only appear at the satisfying redemption of a protagonist you care about. Misko is a natural storyteller. His characters aren’t constructs, but feel like they are flesh and blood. In Misko’s able hands we are transported to a small town in Central Oregon in the late nineteen-fifties. A young Jimmy Stewart would have loved playing the role of Miles Foster, a newlywed, a newly minted teacher, and a man willing to pay the cost for trying to revitalize a dying school and town. Once again, Misko delivers!" "In an unexpected and satisfying ending, Mr. Misko shows that a dedicated, innovative schoolteacher is one of the most valuable of all citizens: teaching our young not just how to make a good living, but how to make a good life." "After having been a teacher for over 23 years and doing battle for my students who were often lost in an uncaring system, I can identify with Jim Misko's Miles Foster and tell you this is a novel that cries to be read not only for its tension and good writing, but for its theme. It's a cause for which a good novel like this will help parents, teachers and yes, students of the future appreciate and support. A must for those looking for a quality read!" "The Path of the Wind is a nostalgic journey back to a simpler world and time—rural, small town America in the 1950s. The hurdles faced by newlywed school teacher Miles Foster are numerous but surmountable: a stodgy school superintendent, his young wife’s difficult pregnancy, students in need of inspiration. In overcoming them, he and the other characters affirm essential values dear to the American spirit. This sweet, unassuming book is a love poem to a past where virtue inevitably triumphs, and small victories tower as monuments. Thanks to Jim Misko’s well-crafted prose, we can practically hear the strains of Tamarack, Oregon’s high school band playing "The Battle Hymn of the Republic," and smell the local diner's cinnamon rolls fresh from the oven."